As far back as 1577, there are reports of recusants—Roman Catholics who refused to attend the Church of England—lodging in Islington, which was at that time separated from the city of London by open country. One priest was arrested for refusing to go to Church of England services in Islington in 1584, as attendance at Anglican services was obligatory at the time, and defiance physically punished. 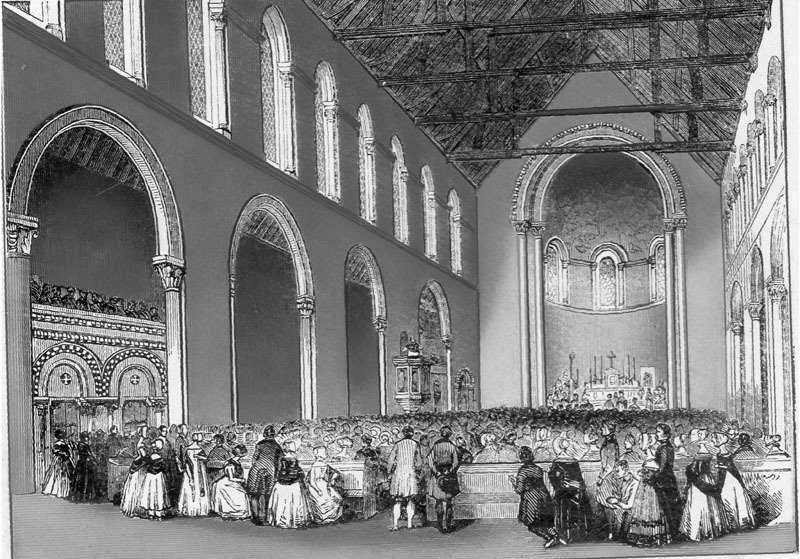 The priests of Moorfields, only four in number, ‘had to attend Newgate, Giltspur and Clerkenwell prisons for felons, the Fleet and White Cross prisons for debtors, the St Luke’s Lying-in and Great Saint Bartholomew’s Hospitals, [and] no fewer than 24 workhouses.’ Thus, thanks to a huge fundraising effort by Fr Rolfe, the mission of St John the Evangelist was established in 1839, only ten years after the act of Parliament of 1829 had granted a decree of ‘Catholic Emancipation’. The school served as a chapel for Mass on Sundays as well as a place of learning for local children. Each day priests walked across the fields from St Mary Moorfields in the city, to the new, unassuming establishment in Duncan Street. They passed market gardens and dairy farms, arriving at the new school, housed in a small building just above the point where the recently constructed Regent’s Canal appeared. The first baptism recorded in the parish registers is dated February 16, 1840. In 1840, there were 600 Roman Catholics living between Ball’s Pond and City Road. 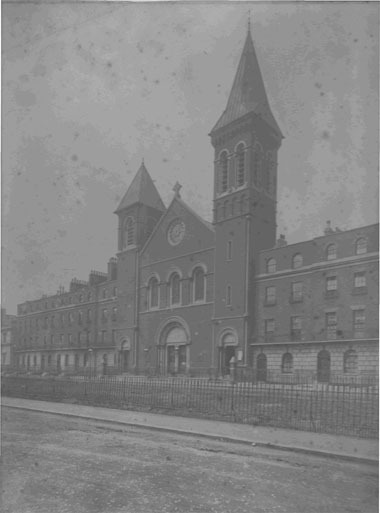 It soon became apparent that the chapel on Duncan Street was inadequate as the congregation was greatly increasing year by year, principally because of immigration from Ireland of Catholics as a result of the political troubles and famine there. The architect J. J. Scoles was asked to design a new building on some land acquired by Dr Griffiths, the Vicar Apostolic of the London District. 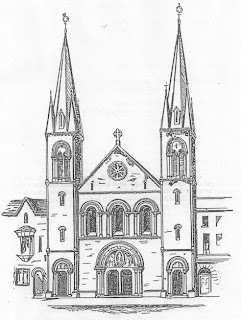 Scoles was one of the leading architects of Roman Catholic churches in the 1830s and 1840s. At that time, there were no parishes and no dioceses. Instead, ‘Vicars Apostolic’ administering areas under the direct control of Rome. Even before the church opened, it was involved in controversy when the famous architect A. W. N. Pugin attacked the design of the church. He believed in building churches with pointed, ‘Christian’, arches. Scoles’s design included rounded arches in the ‘Anglo-Norman’ style. At the time of opening, the two towers planned were not built. St John’s was constructed swiftly, financed by a small group of Catholics, and built by local Irish labourers. 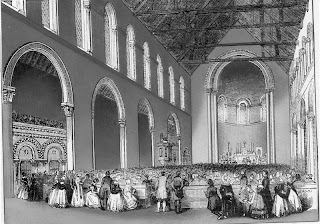 The present church was opened by the Reverend Peter O’Loughlin on 26th June 1843, at a ceremony attended by all the leading Roman Catholics of the day, and no less than 56 priests and four bishops. Bishop Griffiths presided. The celebrated Imperial Mass by Haydn was chosen for the occasion, and it is recorded that, for the first time since the Reformation, the sound of a bell summoning Catholics to Mass was heard in the metropolis. Its setting initially was a bucolic idyll of hayfields and milkmaids, quite different to modern-day cosmopolitan Islington. A brick kiln on Colebrooke Row provided building materials for the rapid construction that took place in the area in the early 1800s. In its early years, St John’s looked out over the New River, the strip of water that ran down Duncan Terrace, which was named after Admiral Duncan in 1799. The river was at times a hazard. In 1799, a correspondent of the ‘Gentleman’s Magazine’ observed that ‘the number of persons drowned by accident in the New River is alarming’. It was arched over in the 1870s, and landscaped with the present shrubberies and rockeries outside the church. The surrounding fields were until the nineteenth century part of one of London’s largest dairy farms. In 1840, it was recorded that one Samuel Rhodes had about five hundred cows for his dairy, and about four hundred acres of hayfields in Islington —with the dairy situated where Duncan Street now is. The buildings on Colebrooke Row and Duncan Street were built between 1760 and 1840. Scoles’s early site plans show the site of the church abutted by fields. Later, the presbytery was built beside St John’s. Several priests attended to the parish in its early days, notably Father Walter McAvila, who worked with the poor. Worshippers flocked to the imposing new church standing proudly in their midst from a wide area, from Stoke Newington, Highbury, Kingsland and Islington—before Catholic churches were built in those areas. Gaslight soon replaced the tallow candles of the building’s early days. It has now served the people of Islington and the Diocese of Westminster for 170 years, and has been a place where the joys and sorrows of parishioners have been witnessed. It has provided a place of solace through two world wars, and stood solid amid the profound social changes they brought about. In 1850, a convert clergyman, Father Frederick Oakeley, was appointed to the parish, where he would spend the last thirty years of his life. Initially, his predecessor refused to relinquish the presbytery, however, and Oakeley had to lodge elsewhere for some months at the beginning of his tenure. Eventually, Fr Oakeley moved into the presbytery, and witnessed the 1850 5th November anti-Catholic demonstrations through the windows of the house. A friend of John Henry Newman, Oxford-educated Fr Oakeley was noted for his interest in music and the liturgy and cemented the reputation of the parish. His concern for people in prison and the poor of the parish would also cause officials to alter policies and change public attitudes. He also spoke movingly over the trials suffered by Catholic converts at the time, adopting a new faith. ‘How was it that we had the courage to leap from the level ground into the untried abyss? Remembering what we were, how is it, that we are as we are? My brethren, I know but of one answer: It is by the grace of God.’ When Fr Oakeley eventually had the towers completed he changed Scoles’s original plans, making them smaller and not matching, something of which Pugin would have greatly approved. During the Second World War, St John’s schoolchildren were evacuated to the countryside, including Sheringham in Norfolk. The rector of the time wrote to the families who took children in, saying: ‘We have nothing but praise for the warm-hearted foster parents who have cared for our children from Islington as if they were their own flesh and blood.’ The church sustained some damage during the Blitz, with the cross on the right hand spire being hit. The cross atop it remained twisted to the side for some years, a reminder of the devastation suffered locally during the war. The iron railings outside the church were hacked to the ground and sent to help the war effort. St John’s is a dignified and beautiful in its simplicity. Its style originally was ornate, but because of the changes brought about by the Vatican Council, some elements were redesigned. The original altar was surrounded by a marble balustrade and wrought metal gates. It was replaced by the present one, which was consecrated by Cardinal Heenan in 1973. In 1978, Cardinal Basil Hume, Archbishop of Westminster, opened the Crypt as a Youth Centre. In the same year, building started on a new infant school block. 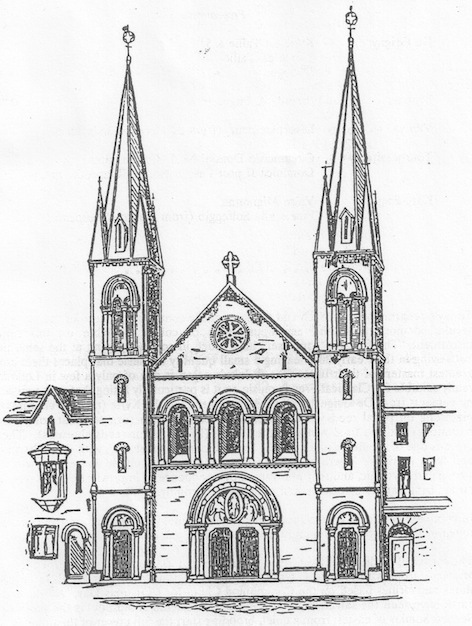 During the great storm of 1987, the spire next to the presbytery was damaged, requiring expensive repair. Today, St John’s stands testament to the lives of the devoted through the years in Islington: from the dedicated priests it has housed, to the ordinary lives it has witnessed from birth to grave. Providing comfort to those in need, and a sanctuary in difficult times, it continues to serve as the centre of a remarkably vibrant and dedicated parish.